Focus - Abso2rb’s synergystic blend of nutrients such as B and C vitamins, magnesium dioxide and zinc are highly effective at improving cognitive function: memory, alertness and mental attitude. This is the result of using this wild ocean harvested source. Energy - Abso2rb’s powerful oxygen enhanced formula is designed to ensure your body is fueled for optimal performance whether you are a high performance athlete, yoga mom or just want to give yourself the endurance you need to tackle the day. ABSO2RB is a brain health supplement that contains living minerals and amino acids, and it is believed that they can be absorbed up to 100% by the body. Unlike metallic minerals that have a natural positive charge, plant-based hydrophilic minerals contain a natural negative charge and are relatively smaller in size and molecular weights. ABSO2RB carries a large amount of oxygen (which is an important factor for absorption). Oxygen also aids the production of metabolic energy and is needed for absorption of vitamins and amino acids. That’s why people call Abso2rb one of the best vitamins for energy on the market. ABSO2RB also contains magnesium, an element important for the duplication of RNA and DNA. ABSO2RB contains more than 90 trace and essential minerals and is one of the best natural supplements for concentration around. It is the best supplement option for people who need 100% digestible supplements to make up for the shortage in their Recommended Daily Allowance (RDA) nutrient needs. 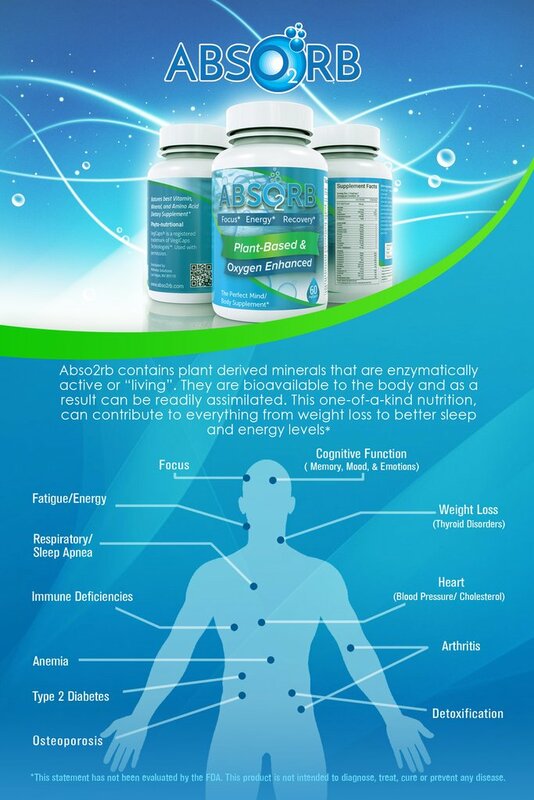 ABSO2RB is the perfect supplement requirement for better health and higher energy boost. It is essentially for everybody in that it is a top vitamin to help focus and fight fatigue. ABSO2RB is widely acclaimed as Nature’s best Multivitamin, Mineral and Amino Acid Supplement. What is Abso2rb made of? ABSO2RB, a top natural brain supplement, has an Ascophyllum Nodosum base and is mixed with essential vitamins, amino acids and minerals to create the Ultimate Mind / Body Supplement. It is no wonder why it is widely referred to as Nature’s Best Multivitamin, Mineral and Amino Acid Supplement. The kelp is ground to a fine powder and mixed with other vitamins. This mix forms a complete dietary supplement; it is one of the most nutritious supplements available in the health industry today. Abso2rb is a natural vitamin to help focus and boost energy. And it works. Kelp is a sea vegetable with concentrate amounts of virtually all known minerals and trace minerals, including iodine, potassium, magnesium, calcium, iron, and amino acids, in an enzymatically active or “living” form. These nutrients are bioavailable for the body’s use because they have been previously absorbed and digested by plants and this has changed them into an easily-assimilated form. Iodine, a notable mineral found in kelp, is primarily involved in the production of thyroid hormones. These hormones regulate and maintain normal cellular metabolism as well as enhancing conversion of adipose tissue (body fat) into energy. Ascophyllum nodosum has been shown to help rid the body of radioactive minerals and heavy metals that may have steadily collected in the organs and tissues over time. If you are interested in experiencing the real benefits of our recovery, energy, and focus supplement, get yours today.